Troy A. Voelker, who was recently selected to fill the position of Bearkat OneCard director, is very excited about the possibilities and appeal of the card. "It really ties in a lot of features that take advantage of new technology and things along those lines, and I also really like the way it looks," he said. "It really resembles the overall functionality of the card and not just a student ID, and I think people are going to be really excited when they see that. "The biggest thing, I really think, about it is the fact that you can tie in the vendor merchants so they can give cash back and discounts," he said. "In the long run, it's really going to allow the OneCard to become a nice way to tie together the entire campus, just in being a part of building an identity at Sam Houston." 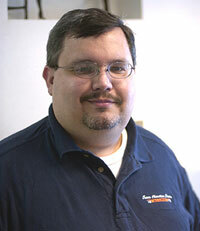 Volker, a Sam Houston State alumnus, will begin his duties in the Bearkat OneCard Services Office on July 16. "We are really proud to have a graduate of Sam Houston State University-particularly working on his MBA in the College of Business Administration," said Thelma Douglass, vice president of student services. "Mr. Troy Voelker comes with a wealth of knowledge from the banking, financial and business background. He has held positions that are advantageous in the development of the Bearkat OneCard Services Office," Douglass said. "I am extremely pleased that we have a person with his expertise to join the Bearkat Family." Voelker received his Bachelor of Business Administration degree in finance from SHSU in 1993. He served as program director for All-American Gymnastics in Clute, Texas; systems analyst for Universal Computer Systems in Houston; banking center manager for NationsBank of Texas N.A. in Houston; and as a cash management analyst for Lyondell Chemical Company in Houston before deciding to pursue his master's degree in 2002. Voelker will receive his Master of Business Administration degree, with an emphasis in management, from SHSU this August. "I'm very excited about it (the position)," Voelker said. "My undergraduate and my master's degree are from Sam Houston, and I'm really excited about being involved with the university." Voelker also has participated in the Beta Gamma Sigma Honors Fraternity, served as a counselor for Junior Achievement and Theta Chi Fraternity.